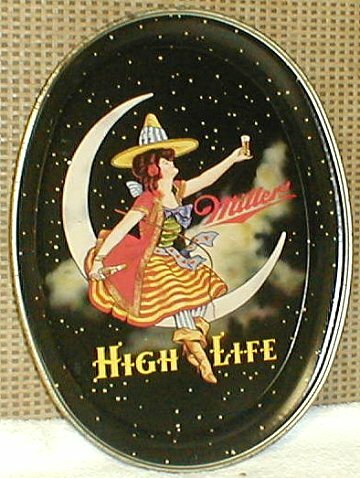 Milwaukee, Wisconsin Comments: Definitely one of the cleanest Pre-pro Miller Lady trays I have ever seen. . I about lost it when I saw this tray stuffed way in the back of a display case of a glass collector. It was the only thing in the booth that was not made of glass. After a little haggling, this sweet tray found its way into my collection. My personal opinion is this is the best looking version of the Miller Lady. This appears to be the same version of the lady which graces the ever so popular Miller Charger. Find a charger in good shape and be prepared to part with some serious cash. 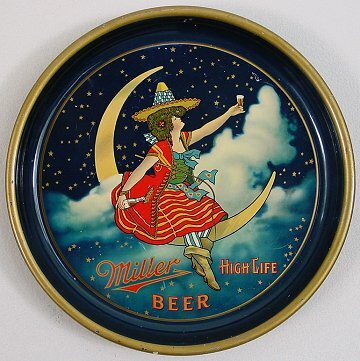 Tray Trivia Answer: At last count, the Trayman was aware of 5 different versions of the Miller Lady on trays - see below. The Pre-pro version also graced their Charger from the same time frame. The 1940's version can be found in a 12" round and an oval version. Lately two new reincarnations of the Miller Lady surfaced. I believe you may be able to purchase them at Brewery Gift Stores. If anyone knows of more, please let me know. The long oval is not in my collection - this picture is from an eBay listing.